Turmeric and Black Pepper for Cancer | Eat This! When turmeric and black pepper (piperine) are combined, they make a potent anti-cancer combination. Several studies have found that a compound in black pepper called piperine makes the cancer-fighting curcumin in turmeric as much as 1,000 times more bioavailable. This is important because when taken on its own, the bioavailability of turmeric is quite low. In a study at the University of Michigan Comprehensive Cancer Center that was published in the Breast Cancer Research and Treatment Journal, researchers found that curcumin and piperine, when combined, were able to target cancer stem cells, the original cells in a tumor that the larger tumor “stems” from. Researchers are planning a Phase I clinical trial to figure what the dosage of curcumin and piperine should be. 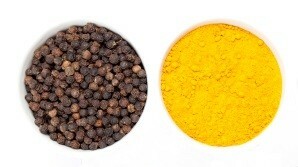 Try adding both black pepper and turmeric to your food to get the cancer preventative and curative benefits. Or, if you currently take turmeric supplements, you can eat a meal with black pepper added as a spice and take the turmeric pill with your meal. There are also supplements on the market containing both curcumin and piperine. If you’re interested in trying turmeric and black pepper for cancer, check out 7 Best Turmeric Supplements to see which of the best rated turmeric supplements contain piperine.